The theme of the film was inventions-that-are-supposed-to-make-our-lives-easier-but-don't... things like Voice Recognition and those Automatic Checkouts you get in supermarkets these days and so on. So the day before the appearance I spent a lovely day with a lovely crew - Anna, Claire, Andy and Quin - racing around London to various locations and filming pieces to camera. We also did some vox pops on Carnaby Street (which must be one of the most vox-popped streets in the world) where two or three people told us they hated Sat Navs. Which then led to us have an off-camera conversation about the merits of Satellite Navigation. In which Andy said that there were soon going to be Sat Nav systems that, instead of displaying a map view, showed you an actual photo of the street you're on from a car's point of view. This in turn reminded me of an incident from many moons ago, which I then relayed to the team. I'd been walking down Bethnal Green Road when a strange car had passed me and caught my eye. It was a small buggy car with a huge nest of cameras on top of it. Curiosity made me gawp at it... then I saw the logo on the side of the car and realised it was photographing the street from every angle as part of Google's street view project. I remember thinking, "Oh no... now when they launch street view, I'm going to be there on Bethnal Green Road forever... and I'll be staring at the car with a look of curiousity so intense that people will think I've never seen a car before." I've never mentioned it to anyone else before because it obviously isn't a huge moment in my life - indeed I'd forgotten all about it until the idea of a 3D photographic Sat Nav brought it back to mind - but it did make ideal, idle chit chat while we we're waiting to film the next piece. Anyway... that was on Monday. I appeared on the show on the Tuesday and then yesterday before I went to bed, I noticed a tweet from a friend on Twitter telling me that the street view service had launched. I was too tired to look it up at the time but I made a mental note to look into it and to see if I really was there this morning. So it wasn't until I got home this afternoon that I was able to check. And by crikey, I'm there. I'm not looking stupidly curious because - thankfully - they blur people's faces but because I knew where I was when I saw the car it only took me a couple of minutes to find myself and in spite of the blurred image I obviously know it's me. ... and here's a close up. I'm not the man in the black t-shirt... I'm the one looking towards the camera. *For any North American readers that would be Where's Waldo? 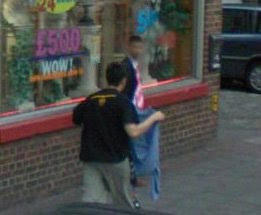 Here's a link for you Dave, http://tinyurl.com/db7jfp takes people straight to the image of you in street view. I found where I was on it but I had the blinds closed. Is that the world's most hideous pink and yellow kipper tie, or do you have some other explanation? Haha, you would. Although that really doesn't look like you at all. I'm very freaked out by this. Only last week I was peering at the roof of our car in a smudgy satellite picture of our street, now I can see through our bedroom window?!! Who took these photos? Is Google Maps run by aliens? Or the council (picture is concurrent with Monday morning recycling)? Fascinating, but also unnerving! Like, burlesque dancer sites, Google Sightseeing provides hours of fun. Thanks, Mr G.
Is it just me or is the man in the black t-shirt some sort of matador, trying to entice Mr Gorman to run towards him (pink n yellow kipper tie'n'all! )in a Toreador stylee? I'm just gutted that the picture of my flat has the grotty old curtains up. Thankfully I'm moving soon, so won't have to live with that embarrasment. Are you sure it is you? Looks quite darks skinned. Post a new photo of you in the kipper tie as proof. So, basically, on the day Google were photographing Bethnal green Road you had turned into a South Asian man? Our dog is on Google Maps, peering out of our bedroom window!!! Sorry Dave but I just don't believe that's you - you don't have brown skin! RE Kipper Tie - It gets better - Chortle have you down as "the man in pink" on their weekly trivia file! I've seen you down Bethnal Green Road in real life, but I have to join the group of people saying that this guy doesn't look anything like you! The question is: where are you in the next photo along? I can't see you anywhere! Mysterious. Sorry Dave, just seen your new 'genius' programme tonight on tv. I'm afraid if you think people are going to believe that the people on your show are genuine members of the great british public, then you are going to have to employ much better actors, to be convincing. The guy that kept blinking like fred skuttle was less than convincing AND the prog was so obviously scripted intergrating Catherine Tate. good for you though to get a prime time spot on the bbc. You've done well since travelling the world looking for people with the same name as yours. Keep going and best of luck to you. Watched Genius earlier today too. I agree with the other guy about them seeming like actors/comedians, but I thought the democratic bus guy was hilarious. The show has a lot of potential, but it will depend on the ideas/characters I guess. I don't even think it looks like you - the dark hair and the skin colour makes 'you' look of Asian origin. My fame will come when they get more Streetviews live - I was on the way to KFC when I was scanned by the Google Mothership. Great first episode DG. It's transferred very well to TV. But can you please have Paul Daniels on to demonstrate his spiked steering wheel? And that's magic! The British public are genius. Look forward to the rest! That's definately an asian bloke in a pink tie, is this somesort of meta joke? Anonymous - if that was a P.R stunt it would have been a pretty poor one. 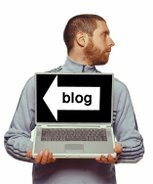 Dave - I believe it is you, but if you did spend your time making up this blog entry for the P.R, you need to get out more. Love Genius by the way. Idea is not that far fetched as a p.r. thing. It's had quite a lot of attention ( chortle,BBC etc) as first 'celebrity' on street view as street view is all over the news . And dave has a book, tv show and a tour on. Call a cynic but I'm sure that is not Dave. Dave looks dark skinned because his brown hair has been blurred and smudged with his pink face, the light is low and there's not a lot of contrast in the photo. You mentalists. I still can't see that that's a bag though. It definitely looks like a clown's tie. It's not him, no way. Definitely not him. Hair blurring into skin doesn't explain the difference in skin colour because the white woman below the off-licence sign in the second pic (http://tinyurl.com/dksvuc) still looks white. What gives, Dave? The intertubes grow restless! Hey Dave - that's not you, that's me! And stop dissing my tie, yeah? That's it. We've had enough of your lies. Think he's probably a bit embarrased and hoping it'll all go away. I can't believe that people are accusing Dave of making this up! 'Honest Dave' we call him round here. Why would anybody make something like this up? I think it looks a bit like him - even down to the beard. Light can play funny tricks. God, I sound like a sycophant - but I'm not, just an admirer. If you were really looking for wally he is here. http://maps.google.co.uk/maps?f=q&ie=UTF8&layer=c&cbll=51.463944,-0.215446&panoid=aTUlkjN4ZDh_2sWaOxjDPg&cbp=12,100.68466007276348,,1,18.20000000000002&ll=51.46386,-0.215499&spn=0,359.987447&z=16 Sorry dont know which html tag to use to make it a link. Loved Genius - only just got round to watching it on iPlayer (and why does everything electronic these days have an 'i' in front of it?) and it blew me away. Loved the set, and the way the contestants / whatever you call ems, moved out. Is that the same Gemius trophy you had for the radio show? And I join the growing ranks of those who think it looks nothing like you. I don't think you're lying to us though, just it is a bad photo. Streetview doesn't actually cover my street - it stops half-way up, before it gets to my house. I feel cheated! @bookmole, totally with you on Google being lazy. I've lived in 3 different places in London Docklands over the past 4 years and none are visible on streetview because Google couldn't be bothered to venture a little further down the road.